“Travel agents? Those are still around?” Why yes! Yes, we are. I hear that more often than you might think, usually followed with “So…what exactly do you do?” Fortunately, I love to talk about what I do! I firmly believe using a travel agent can add immense value to your vacation experience. There are a lot of reasons why this is true, but since not everyone finds this quite as fascinating as I do, I’ve kept the list to a few of the most important ones. This, in my opinion, is the biggest reason you should always, always use a travel agent. 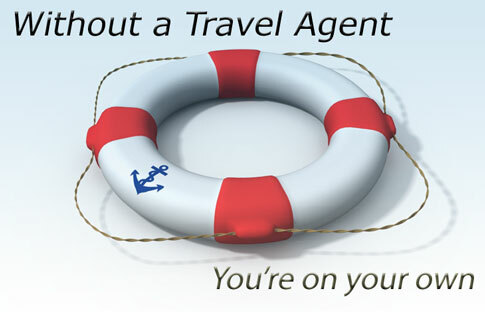 The most important thing to know about travel agents is that we are specialists. The Internet is a wonderful resource, it’s true. But unfortunately, there’s just as much bad information out there as there is good, and you just can’t always tell the difference between what’s a good value and what’s going to leave you wishing you’d just stayed home. As a travel professional, it’s my job to know the difference! Travel agents–especially those who specialize in a particular aspect of travel–spend a large amount of time training, researching and touring vacation destinations, so that we can make sure you know exactly what you’re getting, and what to expect when you get there. We do the “heavy lifting” so that we can recommend the best fit for you with absolute confidence! Questions like whether you need passports or travel insurance, whether airport transportation is included, exactly what’s included (or not) at your resort, and which airport to fly into can overwhelm prospective travelers; travel specialists already know the answers to all of these and all the other questions you’re bound to worry about! Online deals are very appealing; believe me, I always look for the best one I can find! Keep in mind, though, that travel agents provide service and support that you can’t get with an online “deal”. And speaking of deals, we work very hard to get you the absolute best price possible. It may not always be the cheapest rate out there (although you’d be surprised), but we always make sure you’re getting the most for your money. And, you have someone there for you if something goes wrong or you have any questions–both before and during your trip. This peace of mind is worth a lot. Although we spend so much time excitedly planning our trips, sometimes life just happens. Illness, injury, weather events and many more things can disrupt your trip. 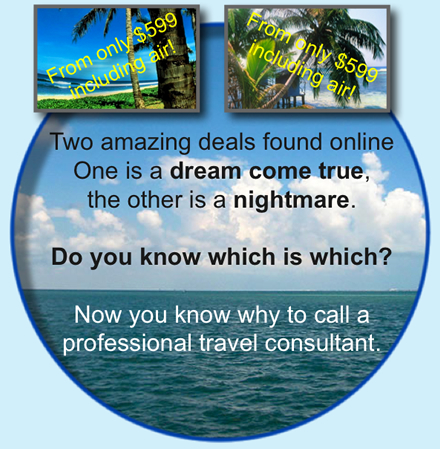 As a travel agent I spend a lot of my time dealing with problems so that my clients don’t have to. When you book with an agent, if your trip is impacted by a hurricane, something comes up and you have to cancel or reschedule, or if something is just not going right, you don’t have to be the one sitting on hold with the airline or the resort getting frustrated! It’s our job to take care of those things so that you don’t have to. With so many experiences out there, who wants to do the same thing as everyone else? You want to have a trip that’s exactly what you want–but if you don’t know exactly what’s available, it’s hard to get what you want. Part of what my services include is custom itinerary planning–which includes everything from finding just the right flight schedule and resort for you, as well as exactly what to expect from your resort or cruise, and recommending experiences that suit your interests. While you’re planning your upcoming travel, I hope you’ll consider booking with your favorite travel agent (that’s me!). Not only do you get an incredible increase in value with the services offer at no additional cost to you, but you’ll be supporting a small business! We as travel agents are passionate about what we do, and what we do is serve you! Win-win, right?